Designed and manufactured by Glow-worm, the Ultimate3 35kW Combi gas boiler is a highly reliable condensing unit that’s compact in size. The Ultimate3 is a highly efficient unit, shown by its seasonal efficiency rating of 89% and ErP A rating. 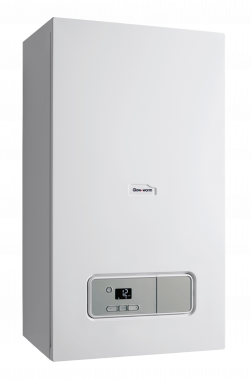 The output rating of 35kW makes this unit perfectly suitable for larger homes that have a high demand for heating and hot water, as well as homes that have 2 or more bathrooms. The range also includes a 30kW model for homes with slightly lower heating and hot water demands. Being a Combi boiler, the Ultimate3 supplies hot water and heating on demand by using the mains water supply. This means you don’t need to have bulky tanks or cylinders, perfect for smaller homes where space is limited. As a compact, wall-mounted unit, this is a unit that can be installed away in a cupboard and not take up too much space. Despite the compact size, there’s still plenty of room for a host of features, such as a bright LCD display with easy-to-use interface to give you maximum control over the unit, a high-quality automotive grade aluminium heat exchanger to provide a high performance, a Grundfos modulating pump helping to reduce your energy bills, a filling loop for straightforward maintenance and full compatibility with a wide range of flue options which gives flexibility when finding a location to install the unit. Featuring a lengthy warranty of 10 years, you know that this isn’t a boiler that will let you down.